When looking across all the races for office this year, it is exciting to see so many people throw their hat in the ring to do some good for their community. With my late retirement announcement last Thursday, I was initially nervous that nobody would have sufficient time to ponder the decision to run for office. Fortunately, many were already thinking about how they could apply their talents in behalf of the rest of us well before my announcement. With the filing period closed now, the candidates names are known. I reached out to each of the potential Republican candidates for my replacement and asked them to craft a brief biography to share. I thought posting this would help delegates and voters in District 9 hear the candidates in their own voice and help them get a feel for who the candidates are before Caucuses convene next week. I know most of these candidates personally and I will be withholding an endorsement for the time being. Here are the contenders (in their own words) presented in alphabetical order. 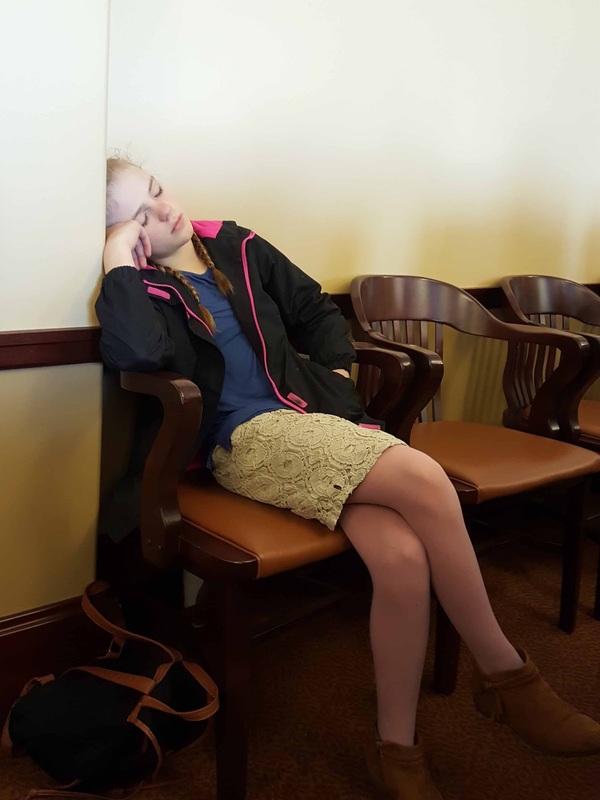 Emily Beeli is a Utah Wife and Homeschool mother. As she raised her children she was inspired to delve into the history of the founding of America and learn about the groundbreaking principles of Liberty and Individuality that empowered the courageous colonists to develop the system we live in today. 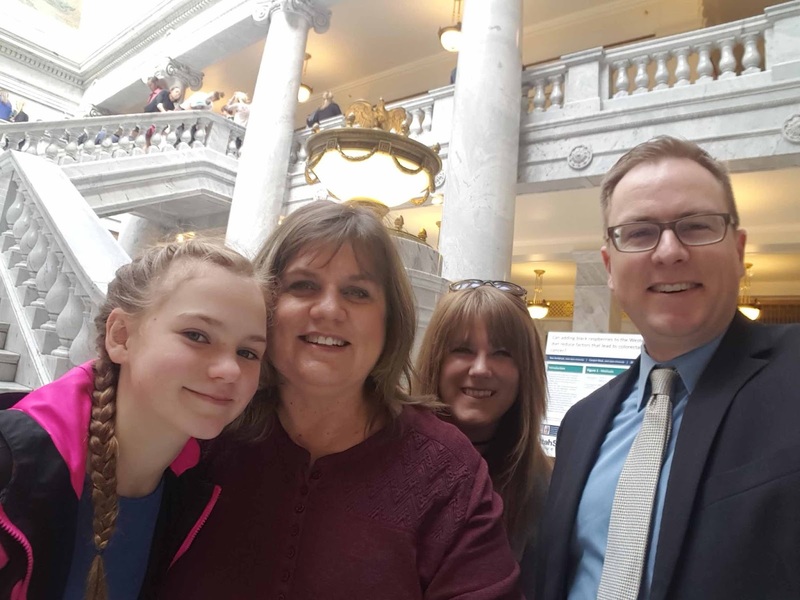 Emily has always striven to be an educated and involved citizen; but it wasn't until 2011 when her daughter got involved in the Teenage Republicans, that Emily began to learn more about the proper role of government and the unique caucus system that we have here in Utah. As she learned more about America's founding principles that set us apart from the entire world; Emily began to notice more fundamental concerns with the way current politicians are making decisions and asserting their authority in Utah. In an attempt to better educate our leaders on the authority of the State. Emily organized several events where Legislators had the opportunity to receive training on the Sovereignty and role of the State in restraining the Federal Government. After getting involved with many political action teams and even forming her own "Liberty Forum" group, Emily has served as a delegate and has now decided to run for a state position. 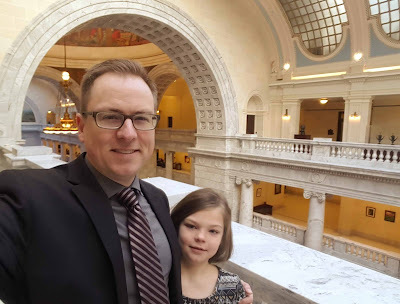 Adrian William Eads is a 36-year-old male who is running for the Utah House of Representatives for the 9th District. 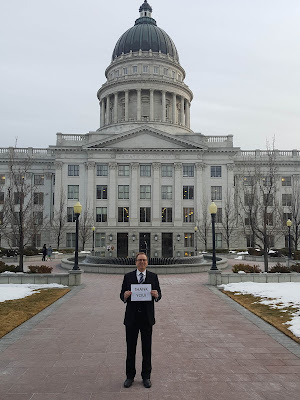 I have been a lifelong resident of the State of Utah. I currently reside in the Trolley District in Ogden and have been in my current house for almost nine years. I bleed purple and have graduated with both a Bachelor of Science degree and a Master of Science degree from Weber State University. I have been married for almost 18 years to my high school sweetheart, Starcia. Together we have seven children and are currently foster parents to two great kids. We have been foster parents for over 10 years and have adopted four amazing children who were unable to go home to their parents. I am employed by Adult Probation and Parole and have been a correctional officer, probation/parole officer, and currently am responsible for supervising staff. I take the safety of our community seriously and am proud to serve as a law enforcement officer in our community. 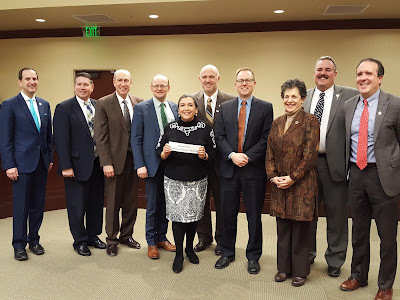 I believe contributing to our community is important and currently serve as a Girl Scout leader, Cub Scout leader, and am on the Board of Trustees for the Ogden Weber Community Action Partnership. I believe the safety of our community is paramount. 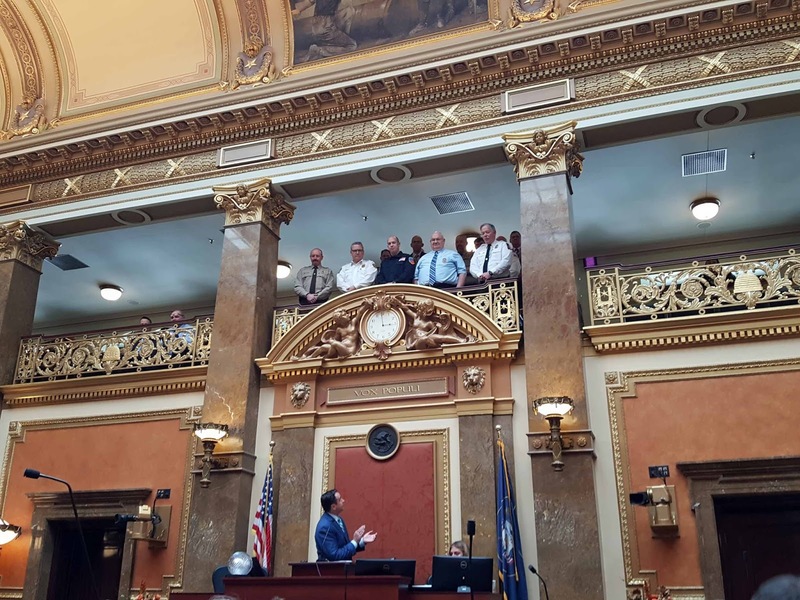 To that end I commit to work on legislation which will make our community, Weber County, and the State of Utah safer. I believe individuals who victimize our community need to be held responsible for their actions. In 2015, the Justice Reinvestment Initiative was passed; however, it currently lacks an effective treatment component and therefore offenders are being released back into the community without addressing their underlying issues. Next, I believe we need to provide for the next generation and help raise our workforce. 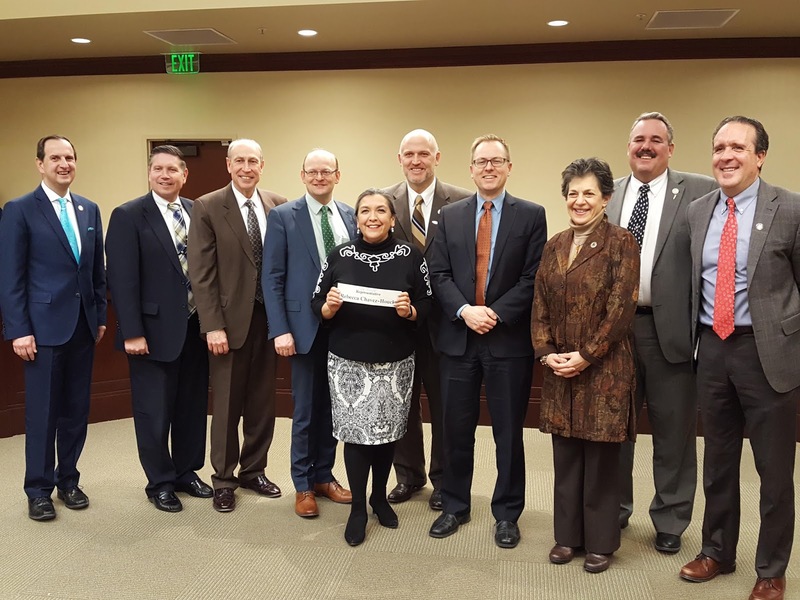 To accomplish this I look forward to assisting to improve our schools, expand choices for parents, incentivize teachers/schools who are exceeding standards, and helping to make sure adults have the training/education needed to support themselves and draw new employers to Weber County. Finally, I plan to work with law enforcement, treatment providers, medical professionals, stakeholders, and lawmakers on both sides of the aisle to combat the opioid epidemic. I commit to only introducing legislation which can be shown to have a direct effect/impact on our community. Mary Khalaf is a wife, mother, former Federal Officer, cancer survivor & civil rights activist with a deep commitment to the Constitutional principles that have shaped the American experience. Mary has operated The Khalaf House, which serves the wellness needs of the community, for over a decade. 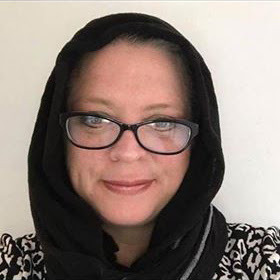 Mary entered politics after seeing the Planned Parenthood videos which greatly affected her as a former patient who almost had an abortion based upon the lies of an immoral corporation propped up by corrupt politicians. Mary has a passion for fighting for the common individual who is over regulated, over taxed & under represented. 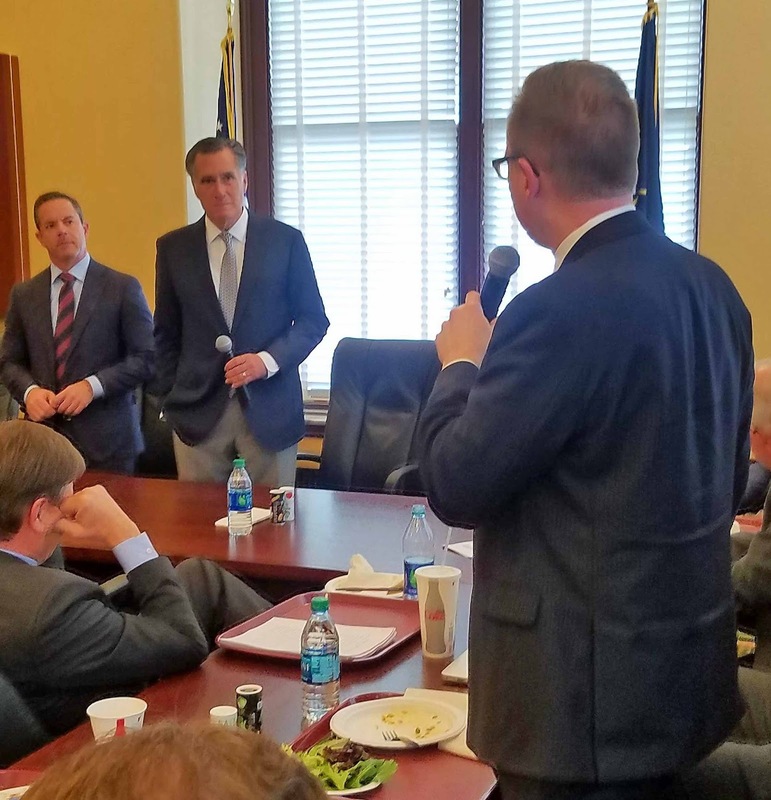 If elected you can count on Mary doing all she can to help shape Utah’s future with integrity, hard work & honesty. Recipient Activist of the Year 2017 by Americans for Prosperity for her commitment to fighting taxes. 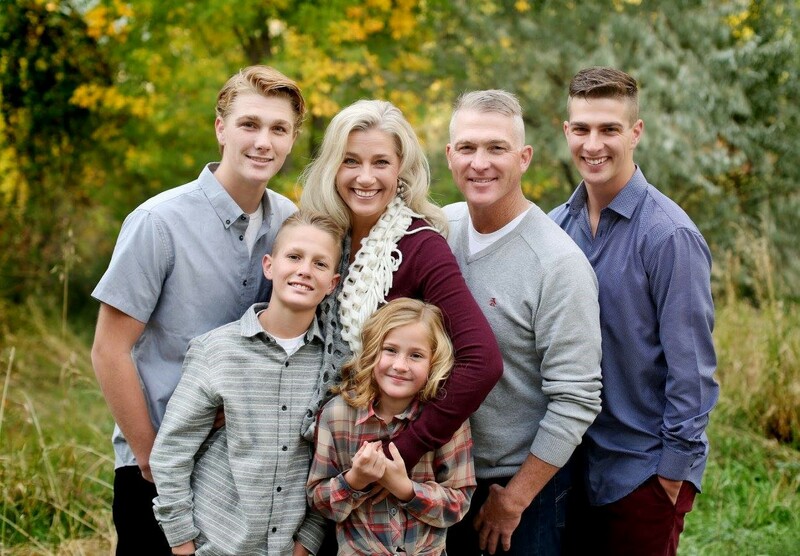 Calvin Musselman was raised from the time he was nine years old in southeastern Utah. He loved growing up in the small town of Monticello and thrived in a small-town upbringing. 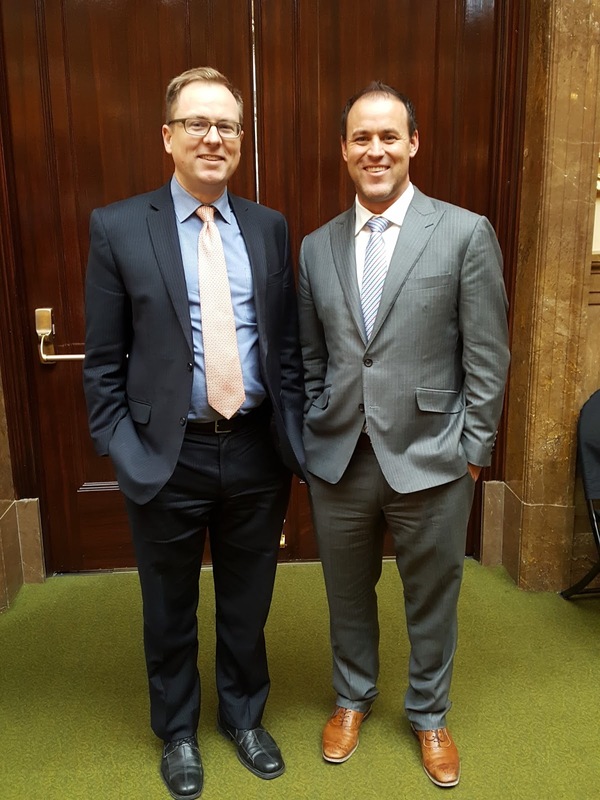 While growing up he fell in love with Utah’s unique outdoors and the recreational opportunities it provides. To this day Calvin counts himself privileged to call Utah home. During his junior year of high school, he enlisted in the Utah Army National Guard with the 1457th Engineer Battalion. Directly after graduating high school he was sent to basic training in Fort Leonard Missouri where he also completed his advanced individual training as a 62 echo (heavy equipment operations). He then attended and graduated from Dixie State College in St. George Utah. Shortly after graduating from Dixie State College he attended the University of Utah, majoring in geology, until he was activated into full time military service for Desert Storm. Upon returning home from Desert Storm he married a girl he had been dating since Dixie College that just happened to be from West Haven named Dawnell Anderson. 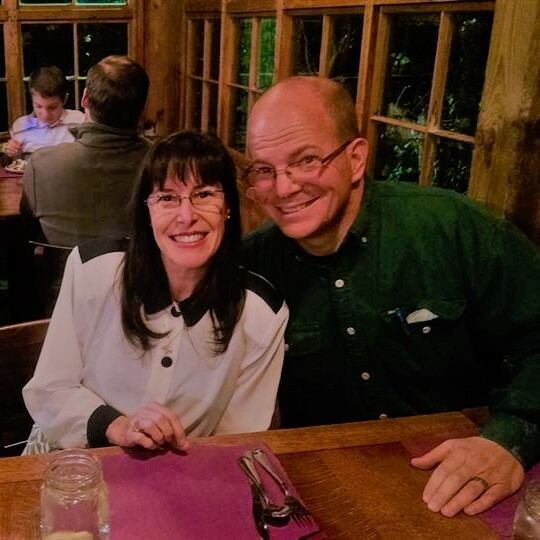 They have been married nearly 27 years and have 4 wonderful children. Cal and Dawnell have not only been equal partners in their marriage but have been equal partners in their small business for over 20 years. Shortly after being married they lived in Ogden on Orchard Avenue just off 21st street. From Ogden they moved to Roy then to West Haven where they still live today. All three of their homes in their married life have been right in the heart of District 9 where they have developed a deep love for the people and area they call home. Calvin has always been dedicated to his country, his state, his home towns, and the people in them. 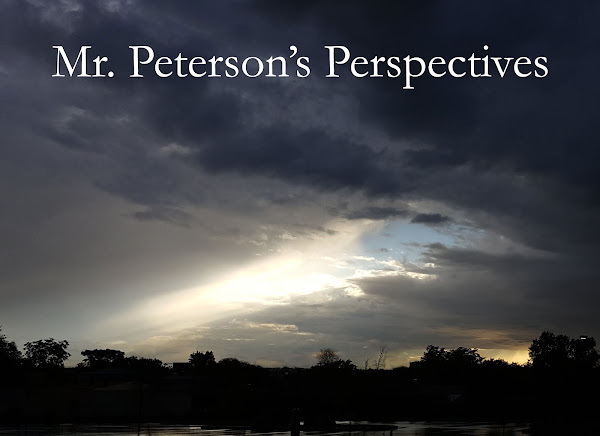 Whether it was his military service, coaching youth sports, volunteering at his kids’ schools, his deep dedication to his faith, or sacrificing his time to serve his professional vocation he has always served. He now wants to take all the life lessons he has received through a life of service to dedicate his time for those that live in his community at the Utah State Legislature. If elected, Calvin is dedicated to uphold the constitution, fight for small business, improved public education, improved economic development in Weber County, and more government transparency. Calvin is a lifelong member of the Republican Party and fully supports the Republican Party platform of limited government. So there you have it. I will see you at Caucus on Tuesday next week! Our annual Sing Along and Roast was a hit this year. We topped off years worth of performances with this politically incorrect piece of pointed satire. With Reps Webb, Redd and me retiring, Rep. Val Potter will need to solicit some new talent to keep the tradition going. Week seven took us to the finish line on state business for the year. 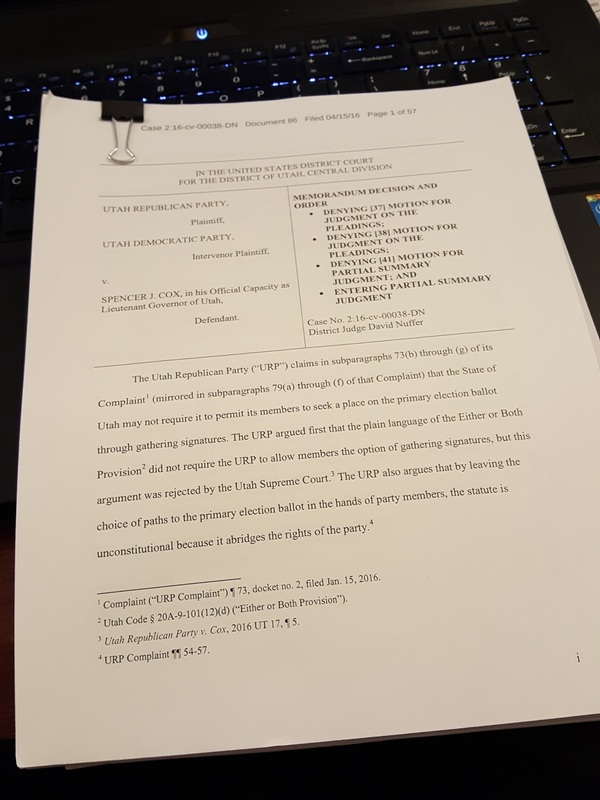 Our week started out with contention regarding the Utah GOP Central Committee bylaws. 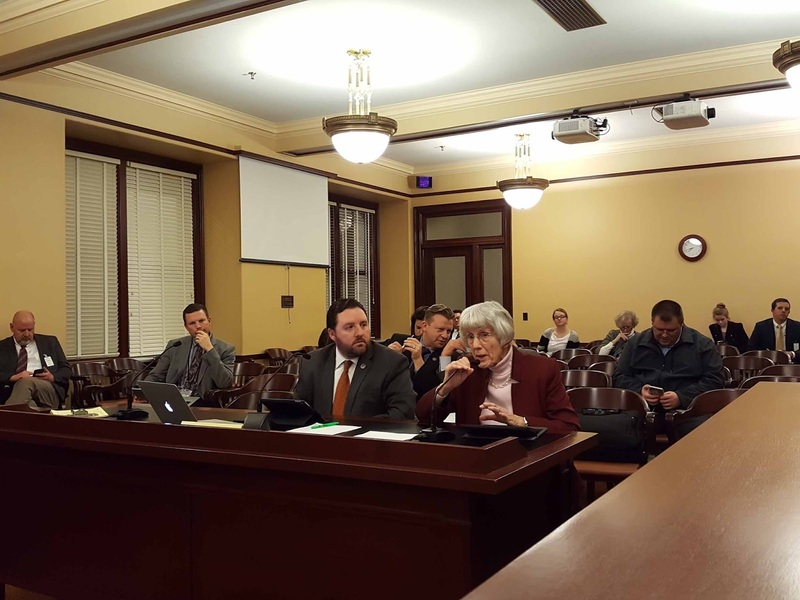 Our committee voted on HB485 to guarantee candidates a place on the ballot this election cycle. A companion bill HB338 also was written. 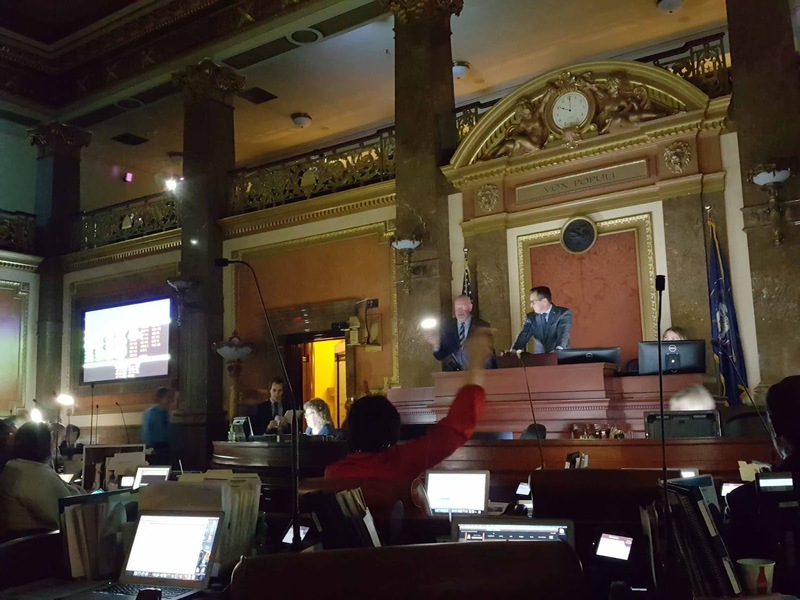 Both bills passed the House and died in the Senate without a hearing on the floor. The question of the Republican party's status now rests in the hands of a judge. It will be an interesting election year! The Legislature also tried to stem damage from a potential $700M tax increase from the Our Schools Now initiative. 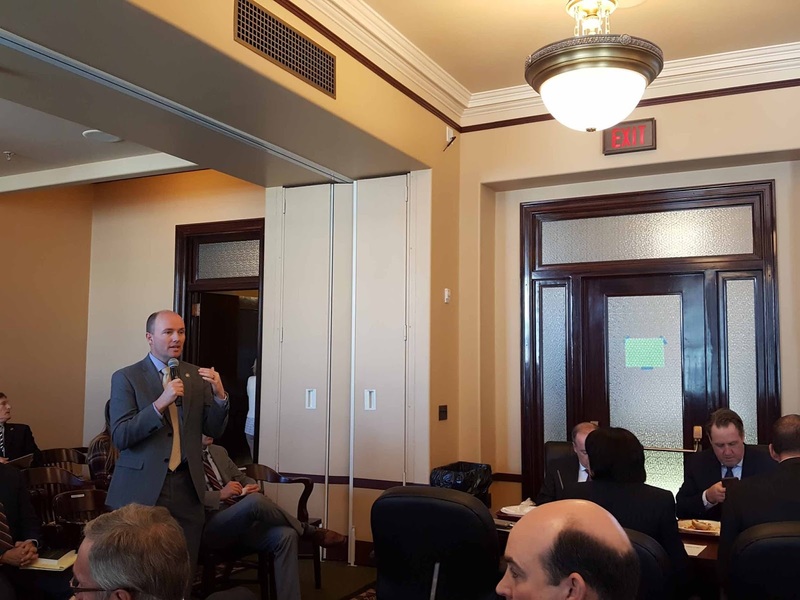 The initiative threatened to destabilize Utah's balanced tax structure by mandating higher taxes on income. 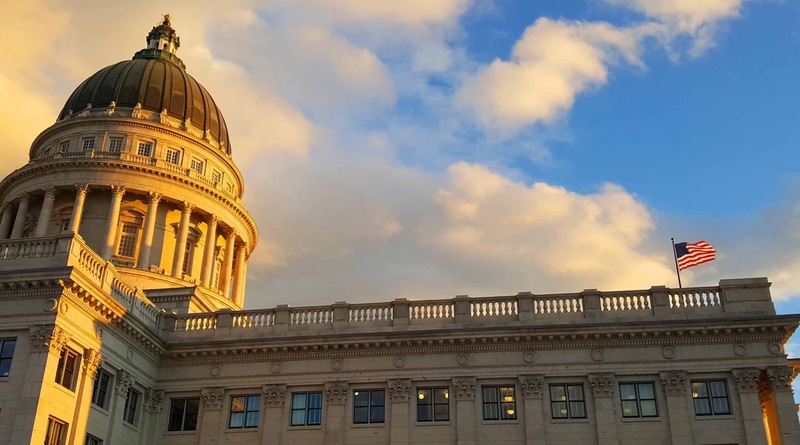 In a compromise, the legislature agreed to a much smaller property tax increase while also passing legislation to reduce the income tax. The compromise also calls for a question to be placed on the ballot to ask citizens if they would tolerate a 10-cent increase in gas taxes. 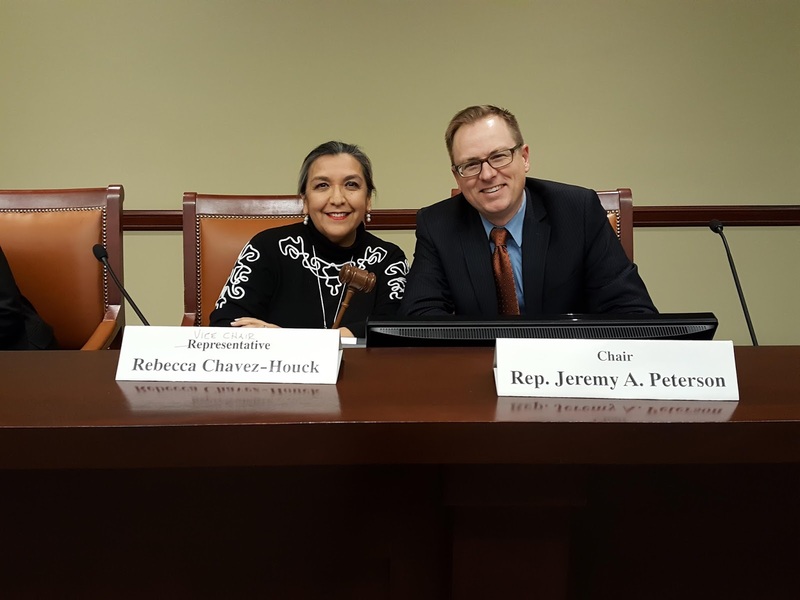 My Democratic colleague Rebecca Chavez-Houck announced last year she was leaving the Legislature. Since she is in the minority party she hasn't had a chance to chair a standing committee. So, I handed the gavel to her and let her steer our final committee meeting for the year. Rep. Mike Shultz and I on the House Floor. 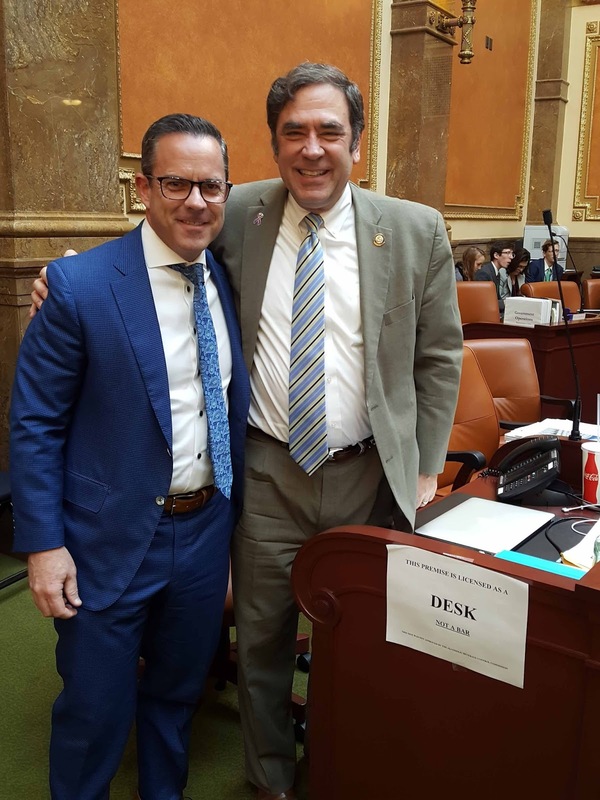 Senator Greg Buxton and I on the Senate Floor. Reps. Carl Albrecht and Kelly Miles on the House Floor. 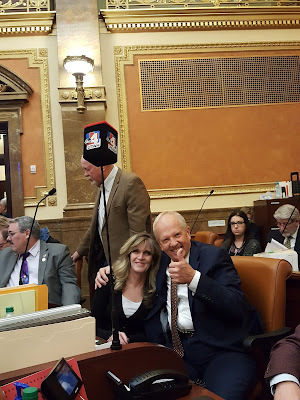 We find that the press sometimes doesn't like to report all the good things the Legislature does. Good news doesn't sell apparently. 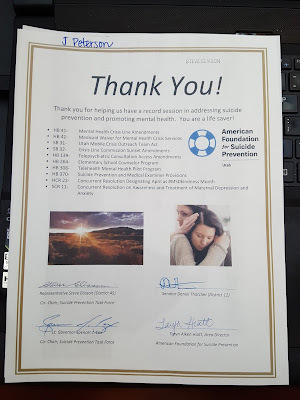 But, the truth is we achieved a lot this year on suicide prevention and opiate issues. 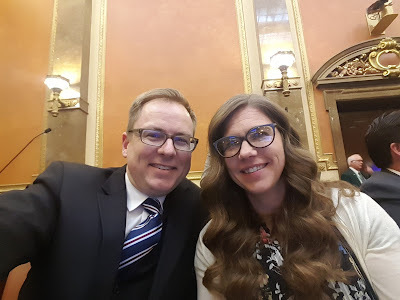 Rep. Mike Noel and his wife hang out on the House Floor during the final night. Mike just announced his retirement. He has been a strong voice on the Floor since I have been at the Capitol. My sweetheart came to spend the final night with me. Here I am at 1:30am announcing my retirement. HB20 - Political Activities and Elections - This bill was a technical clean up bill which passed and the Governor has signed into law. HB80 - Child Placement Amendments - The third time IS the charm. After passing this bill two years in a row unanimously only to see the bill go unfunded ($59,000), we passed it this year AND funded it. 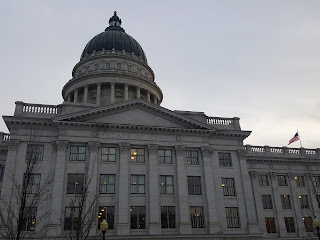 HB110 - Lobbyist Licensing Amendments - A lot of ink was used reporting on the effort to provide workplace harassment training for lobbyists as a condition of licensing. I spent hours in meetings negotiating with the lobbyist camp and running interference between them and our legal staff who were trying to craft effective language that was not to onerous. Yet, in the end, this bill died in the Senate without a debate on the floor due to a lack of time. The hilarious irony is that late in the Session I submitted an amendment to HJR16 which incorporates this same training idea for the media and that bill passed! So, lobbyists don't take the training for now yet the press will start doing so next year. 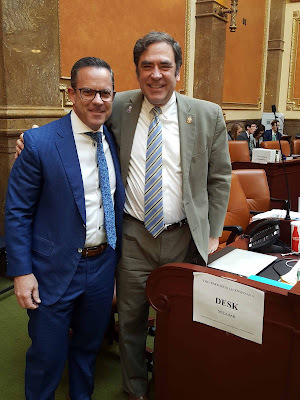 HB126 - Offender Housing Amendments - This bill was drama from start to finish. At first, I had to overcome some significant disagreements between me and the Department of Corrections. Once we overcame that obstacle, getting the bill written correctly proved a challenge. Later, House Leadership tangled with Senate Leadership and the program was unfunded with dozens of other programs falling to the same fate. 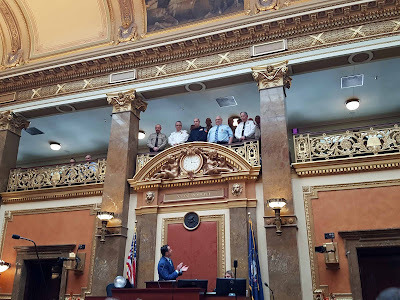 In the end, we pulled the funding provision from the bill but kept the policy directive in place for future construction of new community correctional centers. Unfortunately, the way that was drafted created confusion between leadership and the fiscal analysts who each had their own ideas on how the funding mechanisms were interpreted. 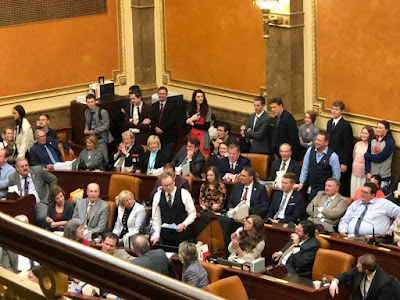 We got a last minute amendment in place the afternoon of the final day of the Session and the bill passed and now sits on the Governor's desk awaiting a signature. Future legislatures will fund the initiative. As it's funded, we will see significant changes across the state in how our inmates are reintegrated back into society. HB270 - Teacher Employment Amendments - This bill sailed through the House and Senate and sits on the Governor's desk awaiting a signature. HB384 - Trust Deeds and Statutes of Limitations - I spent many hours in meetings with the Bankers Association, Chase, Wells Fargo, the Credit Union Association and others trying to get this bill right. Unfortunately, we ran out of time. I will pass this issue on to another colleague to work on over the interim for next session. Clarifying Utah's statute of limitations for foreclosing on mortgages is an important issue to resolve. who have helped me in being elected to and serving in higher office. Having consulted with my dear wife and family, we feel that now is the right time to take a pause from public service as we focus on shepherding our four daughters through adolescence and give much needed attention to our growing business ventures. District 9 needs a strong voice at Capitol Hill and I encourage anyone with the aptitude to serve to file to run. May God continue to bless our community and the great state of Utah! Week 6 saw the Legislature enter its traditional logjam as bills streamed out of committee en masse and landing on the Floor reading calendars. 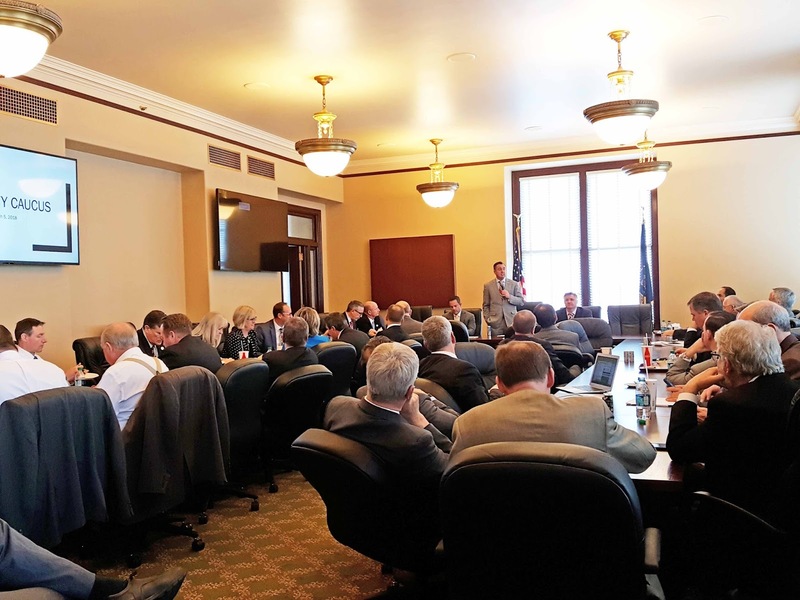 The committee agendas this week were typically followed in ad lib fashion as bill sponsors were double or triple booked trying to present all of their bill files to multiple committees during the same hour block. Nevertheless, we survived. The week also saw some interesting and important events. We started off the week honoring our firefighters. 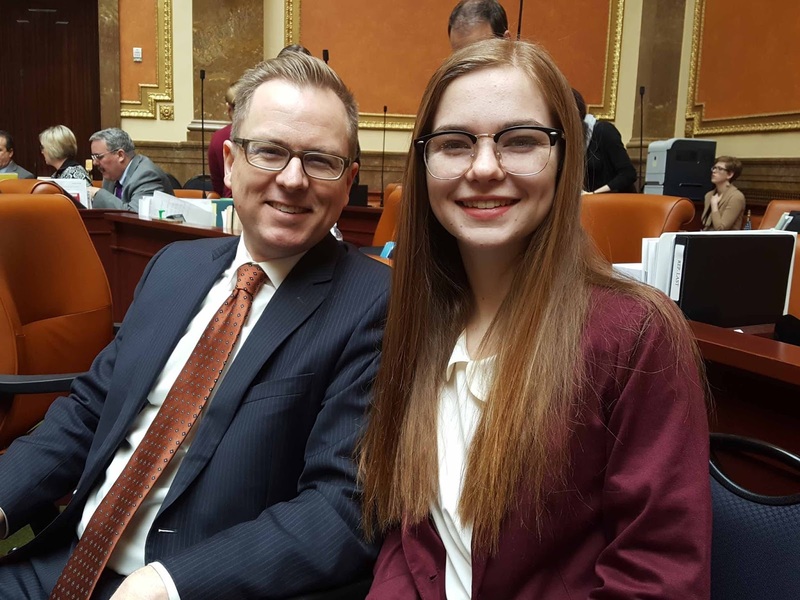 My oldest daughter Hannah spent the day with me on the Hill. She had a great time and really enjoyed herself. Mitt Romney paid us a visit. I had the opportunity to ask him about his views on the Administration's criticisms of NAFTA and the potential for trade wars. Given the announcement from the White House of steel and aluminum tariffs a couple days later, my question was prescient. We worked till after 10pm on Tuesday debating bills. We worked so late that the lights automatically turned off. 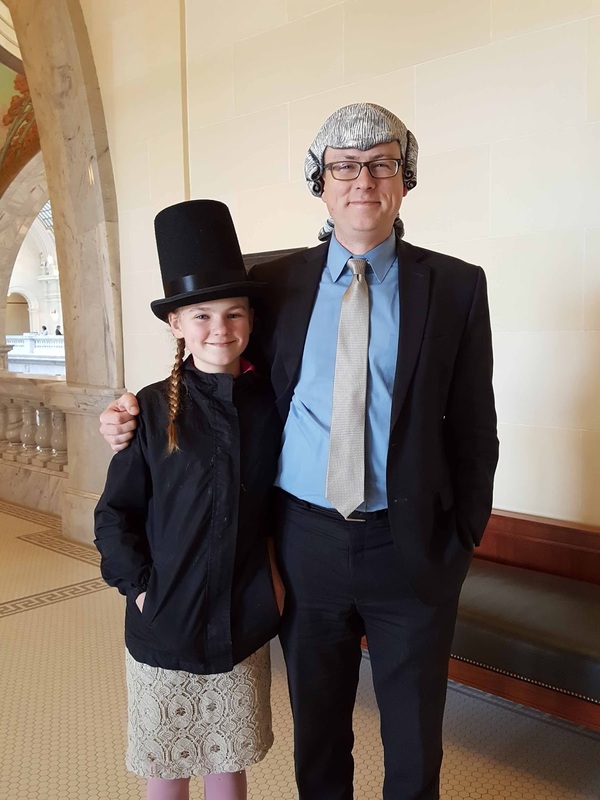 My third oldest daughter, Sophie, spent the day with me at the Capitol. She brought a fake powered wig and waited all day for me to pull the Abraham Lincoln hat out of my props closet (yes, my office has one of those) and get this photo taken. Before that, she did what most of us in our committee meetings really want to do. My mom, sister, and daughter spent some time with me as well. Then they headed downtown to do some shopping. 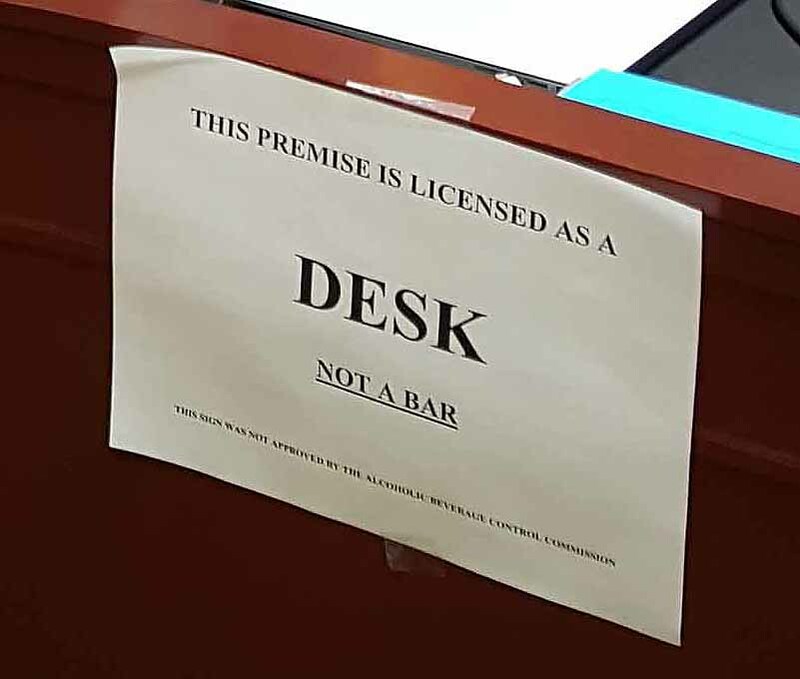 Majority Leader Brad Wilson is teased by Minority Leader Brian King who #Resists the sign requirements for Floor desks. The State Central Committee of the Utah Republican Party took actions that inadvertently threaten to sabotage the elections this year. It was a wild meeting that devolved into disorder and chaos and culminated in the adoption of bylaws that, ironically, would obliterate the caucus/convention system that the SCC is trying to protect. Lt. Gov. Spencer Cox gave us a frank and honest legal briefing on the matter. The bottom line? Republicans should be terrified. Here is a video that is the perfect metaphor for results of the SCC meeting. The 51 people that voted for the bylaw change have set off a thermonuclear reaction that is far more dangerous than anticipated..
"This incident pushed the dangers of fallout from nuclear weapons (i.e. SCC meetings) clearly into the public mind." 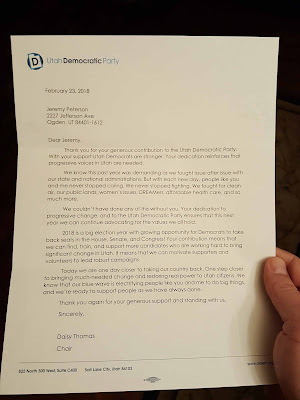 The Democratic party sent me a thank you letter for donating to their party...even though I didn't. My youngest daughter, Esther, spent the day with me at Capitol Hill. We debated and passed out a Medicaid Expansion bill that would leverage the State money already going into the program to cover more people with the addition of Federal dollars. The program would require a Federal waiver. If the wavier is not granted, nothing changes. If it is granted and the bill implemented, the bill would terminate the program if the Federal Government made any changes to their contribution to the program. The program also has work requirements and other common sense provisions unavailable in previous Medicaid expansion proposals. 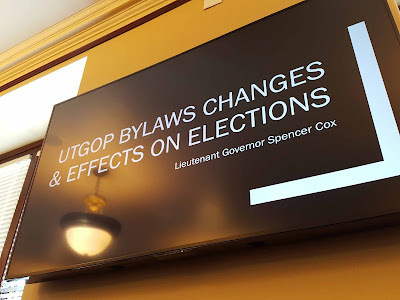 HB20 - Political Acitivies and Elections - This bill has been signed by the Governor. HB80 - Child Placement Amendments - This bill is tabled on the Senate 3nd Reading Calendar and should be funded. 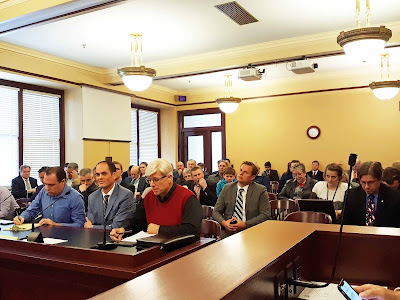 HB110 - Lobbyist Licencing Amendments - This bill passed passed the House Floor and was heard by Senate Committee. It passed out of both bodies. HB126 - Offender Housing Amendments - This bill's funding was caught in the crossfire of House and Senate negotiations. We are looking for any funding mechanism we can find at this point. If not, we will pass the bill with no appropriation and have the blueprint in the books for future funding. 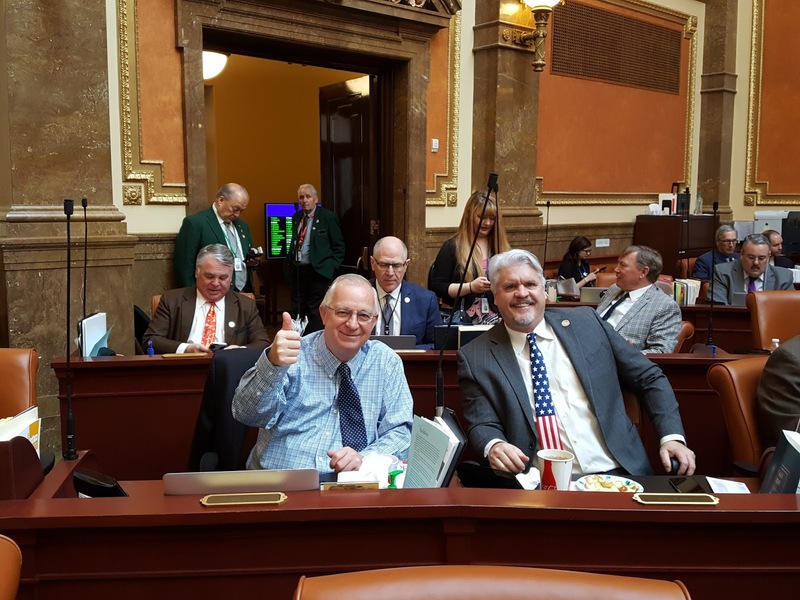 HB193 - National Popular Vote Interstate Compact - This bill will return to rules committee and expire. Our committee vote count was never sufficient enough to bring it up for discussion and pass. I am still convinced it is a sound policy proposal despite the vitriolic emails and phone calls I received from the misinformed. HB270 - Teacher Employment Amendments - This bill passed the Senate and is being enrolled. It goes to the Governor's desk for a signature. 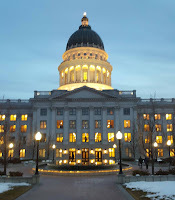 HB384 - Trust Deeds and Statute of Limitations - This bill fizzled out this week. 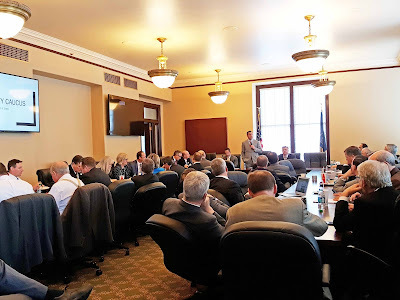 We had another round table with the banks and credit unions and our second draft of the bill created more complications than expected. 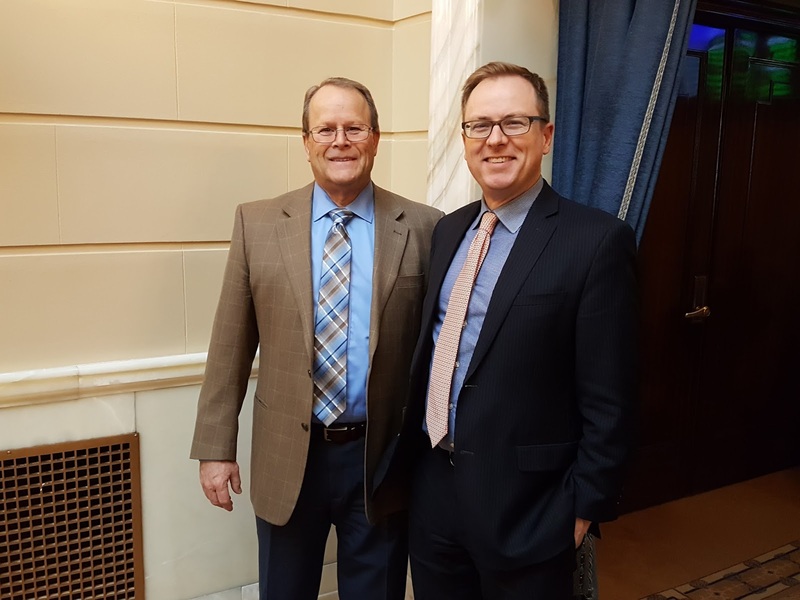 This issue will be discussed over the summer and another bill brought back in 2019.